My 2011 Goals – Take Two! On May 1st, 2011, I began a five-month hike on the Pacific Crest Trail. Through extreme landscapes, life-threatening weather, and enlightening moments, I filled over 650 pages of journals with sketches, thoughts, beer labels, food cravings, and encounters with wild animals (like other long-distant hikers). So it is with great pleasure that today, on my fifth “trailversary” of starting that long journey on the PCT, I am announcing my relationship with Heyday Books. 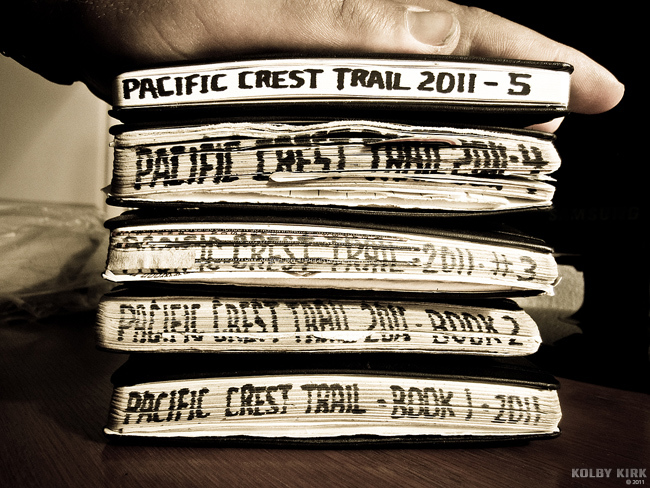 This marks the beginning of another long journey and will result in the publishing of an illustrated book of my 2011 Pacific Crest Trail journals! If you would like to receive updates about the book and you have a Facebook account, I suggest subscribing to my public Facebook page. I tend to share my life on there the most. You can also follow me on Instagram, too. If you’re already following me – thank you! I look forward to sharing this journey with all of you.